I've decided to take a fairly dark approach to painting my Dire Avenger here. 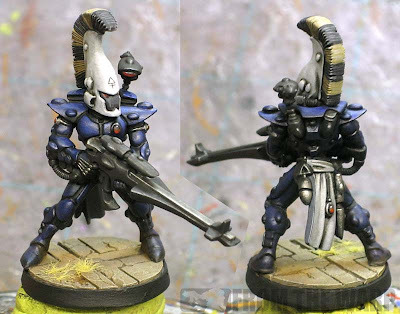 More often than not, it seems like Eldar are treated almost like cartoons and painted in very pure, clean, bright colors. Dark Eldar get the dark and brooding color schemes, but I don't see many "dark" Eldar schemes. That being said, here's how I went about giving this guy a dark look to his armour and that grim dark feeling overall. Like I mentioned, these guys always seem to be painted up pure in color. I wanted to see if I could step away from that with this guy. I primed him black and knew I was going to leave a good bit of that showing. I had no intentions of painting every armour plate blue and then shading it all. I decided just to leave it black. There are four steps to his armour. Three if you don't count priming the model black. The first step then would be to go over the prominent armour plates with GW Regal Blue. You want to be neat in your application, but you're not going to apply it over the whole model. The next picture will break down the areas better. Once that dries, it's a single highlight of GW Ultramarine Blue on a select few places. The last step (#4) is a quick wash over the whole model with GW Asurmen Blue to tone it all back down. We want dark remember? With this guy, I didn't paint every surface of his armour. When it came time to basecoat him (the previous step 2), I only applied the GW Regal Blue in the areas where light would hit it. Think of it as though the armour were actually black and you would be highlighting it with the Regal Blue color. It's only done on the upper and visible surfaces of the model that an overhead light source would hit. This picture here shows you what I mean. The orange areas are where I applied the basecoat on the right side of the model. The yellow areas are the "highlight." If you notice the yellow marked highlights are only on his shoulders, chest and upper portions of his arms. I skipped the highlights on the rest of the model. This helps draw attention to his head area. The white helmet doesn't hurt either. The whole armour process takes no time at all. You can get away with it for a couple reasons. The armour is dark blue. It's dark enough that people think the visible black is just blue in shadow. To help that, the basecoat color fades easily enough into black that you don't need perfectly wet blended gradients on his armour. I didn't worry about the blending at all honestly. The helmet does require some work though. For no other reason than it's white. Even then, I really only painted mine light grey and highlighted with a little bit of white around the face. I wanted the grimy look. I painted his eyes first with red and gave them a GW Devlan Mud wash to darken them slightly and clean them up. After that, I painted the inset portion of his face mask black and blended in some GW Foundation Adeptus Battlegrey. The helmet overall is where I put the majority of my work in this model. 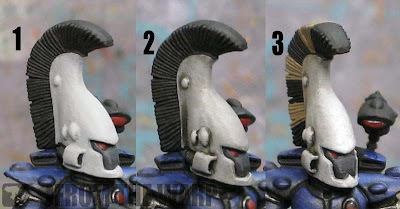 When it comes to the white on the helmet, the first step is getting a good basecoat of light grey. A few thin coats is all it took over the black. Over that, I gave it a wash with Secret Weapon Soft Body Black (step 2). I went heavy so that it pooled around the back of his helmet as though grime had built up. 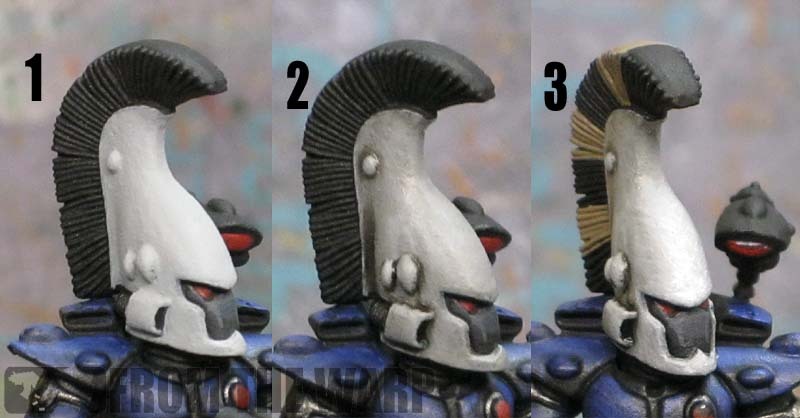 Once that dried, I touched up the very front of his helmet with the original light grey color. The last step is to take some thinned out white and go over the face area to make it stand out. It doesn't have to be much, just enough to give the feeling that the helmet is white. The rest of the helmet is detailing so to say. The freehand is done with a brush and some thinned GW Charadon Granite. I kept away from using black because I didn't want the high contrast there. I wanted it dark, but not black. Black just looks odd to me with these kinds of things. The crest started out all black and I blocked in the "yellow" areas with GW Foundation Dheneb Stone. Again, since I was going dark and more muted with my color scheme, I kept away from using a nice, bright yellow here. Over the Dheneb Stone, I applied a thinned wash of GW Foundation Iyanden Darksun. This gave me a very slight yellow tint to the lighter portions of the crest. Not wanting it to be too yellow, I gave the whole thing a light drybrush of light grey to give me my muted highlights. I took the same light grey color and thinned down enough to carefully draw a series of parallel lines over the top of the crest. Had I thought about it ahead of time, I would have cut the grooves in before priming so my drybrushing could pick them out and I wouldn't of had to add them in as a faux texture. The whole thing is finished off with a wash of GW Devlan Mud to darken down the light portions and tone down the highlights some. His short back tabard is treated in the same manner as his helmet is except you skip the thinned white highlights at the end. All of the metallic bits are done with Boltgun Metal and given a wash of Badab Black. I opted to leave off any gold thinking he was more of a rank and file troop that wouldn't have any fancy trinkets. His gems are all red for consistency and they're done with the standard approach. Start black, fade red up from the bottom and add a small white dot at the top. I did go over this guy with a couple weathering powders. I hit the black areas with a metallic iron and added some brown around his feet. Not much more than that. His base was given a basecoat of GW Foundation Khemri Brown and two drybrushes, one of Dheneb Stone and then one of Bleached Bone. A thinned wash of GW Gryphonne Sepia darkened down the cracks between the stones. The base also comes from Secret Weapon Minis. And here's the final model. All in all, I'm happy with how he turned out. He's almost Dark Eldar looking because he's so dark. I prefer this much more than the bright colors I usually see Eldar done in. This make them look much more sinister to me. If you look at the picture above, you'll notice the bright yellow static grass I added in between some of the cracks in the stones. It pretty much ruined the model. To the point where I have ordered a basing "kit" with a variety of grasses and I'm going to redo his base the right way. Lots of times we add resin bases to our models and just paint them up. This works 99 percent of the time. Sometimes though, I think you have to look at your resin base as a backbone to work from. It's what you use to add your grasses, snow, gravel, water effects whatever on top of. I missed that opportunity here. I had a good backbone, but I fell short in finishing off the base. I'll redo the base and post up some new pics in the coming weeks as soon as my basing kit arrives. I'll show you the difference when you go the extra step. I love the way you applu the highlights and shadows, the helm especially looks amazing. Awesome as always man! As a tip on the crests, try stippling rather than striping the "ridge". It represents seeing the brush of horse hair that you would see. I like your more active use of the primer as an illusory deep blue. I do that a lot on darker models in a somewhat less coordinated way. This is a more thoughtful approach and I especially like that it did not require much, if anything, in the way of blending. In terms of unit painting it seems like a great way to go with some alacrity and still get great looking models. I'll have to give it a go. Pirate Viking: Nuts, I never thought of doing it that way. 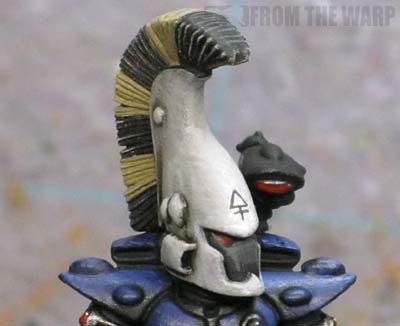 Thanks for the tip... if I do another helmet crest, I'm going to try that to see if it works. GoldenKaos: Badab Black and Devlan Mud... they are great, but once you get past them, a whole new world opens up. Swelter: I'm looking to get the most from each layer of paint really (read: I'm lazy). I'm tempted to try this with an Ultramarine model to see how he comes out. It might be enough to take the pretty boys in blue and make them look suitably dangerous for a change. I love your take on Eldar; Much more militant looking. Wow! That looks great and yeah, you so mailed it in on the base but sometimes you on;ly know what you want it to look like once you see how you don't want it to look. Thanks for continuing to post inspiring hobby content! interesting stuff. 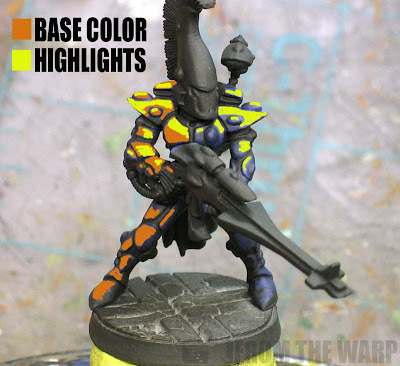 i would love to see a similar highlight breakdown for a marine (not sure if you have done one in the past) because i am having huge trouble working out where to put the different shades. Nice article. I think the grim dark style can fit eldar just as well as marines and that too. Heres a link to some dire avengers I painted, with aim of steering away from the cartoon brightness. I found hightlighting with a grey pallette helped take care of the very vivid purple I could have ended up with. Hudson: Militant... that's a good word for it. Zab: Thanks. Very true about the base. I'm hoping a variety of materials will help me with my issues. Atreides: What kind of marine? I was thinking of doing this on an Ultramarine to see how it would break down. Gonders: Nice work. I can see yours look like they have the high contrast highlighting, but the photos appear to be in black and white. I wouldn't mind seeing an ultramarine painted. I've got a few of them to paint in my immediate future! Very cool, the colourscheme really gives the mini a ton of character! Awesome break down man, I'm going to give it a try. Ase: I hoe it works out for you... it's kinda like cheating, but I like the effect. Drathmere: Let me see what I can do. Manufactorum: Of course, use whatever you'd like. It's the reason I post all of this stuff. Hephesto and Kaughnor: Thanks guys! I just LOVE this colorscheme! Any chance of doing the same on e.g. a guardian (love to see how you handle the standard white suit/green helmet colorscheme with this technique) or a jetbike? Nico: Thanks! Let me see if I can come up with a Guardian model to try it on. Atreides: Yes. The highlights work the same. All you're doing is moving the whole thing up in the value scale. Where I'm working with black and dark blue, you might be working with brown and tan or light grey and white. The hue (red, green, blue, etc.) doesn't matter as much as getting the values (light and dark) close. So for you it might be a light grey prime followed with a yellowy desert color for your base. That would be your shadow color or you could prime him a light tan/brown color to make it even quicker. Over that would go your yellowy desert color and then a single highlight on the upper portions for effect. This looks great! 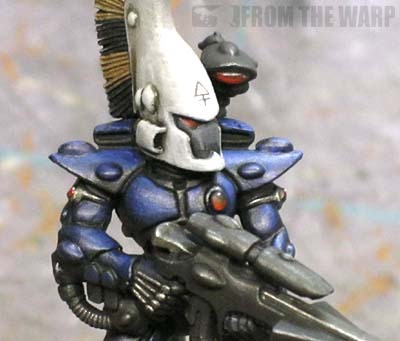 It really does bring out the sinister edge that is often overlooked in the Eldar. Kamui-CT: Sinister... I'd be happy if people thought of them like that based on the paintjob. Thanks!